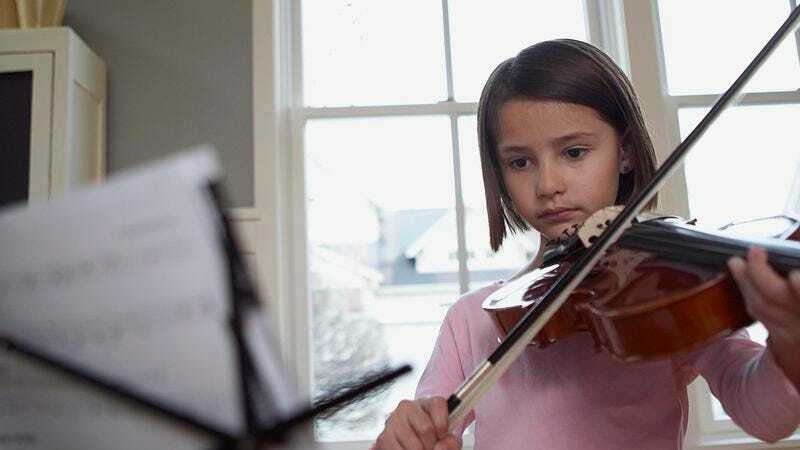 ARDMORE, PA—Expressing frustration at how she continues to remain silent and passively go along with whatever they say, the parents of Olivia Edison, 10, told reporters Wednesday they wish their weak-willed daughter would push back even just a little against the violin lessons they make her take. “Jeez, what’s wrong with her? She hasn’t said one thing about how she doesn’t like the violin or how she hates having to practice her scales every day—what a little pushover,” said Olivia’s mother, Nicole Edison, 41, lamenting the fact that her cowardly daughter has yet to mutter an aggravated comment under her breath or roll her eyes at her parents even once despite a demanding schedule of weekend classes and out-of-town recitals that would elicit considerable resistance from a less gutless child. “We made her rehearse for two hours yesterday, and she just sat there taking it without even a sigh of annoyance. She needs to grow a goddamn backbone and ask to go play with her friends once in a while, for Christ’s sake. It’s pathetic.” Olivia’s mother then shook her head and added that if her daughter wasn’t able to confront her parents now about the violin, she was never going to be brave enough to mount even a tepid protest when they eventually push her into majoring in pre-med.